The pumpkin in the urn used to be my pumpkin topiary but this year I had to change it up a bit because somehow it became dismantled during the move. 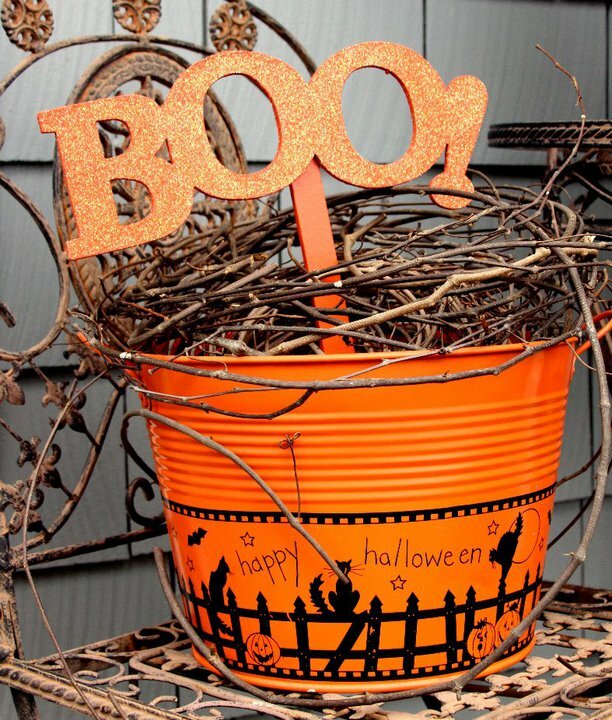 I put this together after being inspired by my friend Heidi's Boo Bucket! This is my wreath. It is a bit old and I meant to get a new one for this Fall...but didn't. Although garden/house flags aren't quite as popular as they were a few years ago, I still love mine! I even have a mini flag on my mailbox. I had to put a little something here. This sweet pumpkin was one that I received several years ago from a blog swap. That makes it extra special! This is my youngest son's favorite Fall decoration. He can't wait to arrange it every year. I have several cornucopias that I need to find places for. Nothing like a great apple candle to get me in the mood for Fall! This pumpkin actually holds several candles inside and does double duty on the breakfast table. OK....now that I have the decorations out...I am ready for some Fall weather! It's beautiful! You have such a lovely home! I'm really ready for Fall, we had such an unholy hot summer! Now I need to get the Fall decorations out too--feel like I'm way behind! I love all your fall decor...I love fall, too, although we have a gazillion leaves to deal with. I haven't ventured down to the storage room room to get out the fall stuff yet, but I think this weekend that will have to be on the agenda. We need rain and cooler temps, though....my grass is crunchy and the shrubs are drying up. What a difference from this time last year when we had floods! Beautiful! Your front door is stunning. Beautiful Home you have and I so love your decorations. Looks great! Your front porch is very warm and welcoming. It all looks so pretty and perfect for fall at your home Michelle. Your front door is gorgeous. What a lovely entryway you have! I'm so ready to start decorating for fall/Halloween, but the weather has to dip below 90 at this point! Geez, it's Fall already, let's get on to the cooler weather! Love the fall decor! I am a huge fan of garden and house flags. I have so many that I change them all the time. Hubs and I always fight in the fall because I want to put our my pretty fall flags and he trys to leave our college flag out for football season. Michelle, your front porch looks so inviting all decked out for fall. I need to get out of my chair and start decorating. I'll do that in a couple of minutes for sure. Your decorations are as lovely and beautiful as ever! And I am glad to see that I am not the only one still putting out flags! I bought some fresh items Monday to go with fall decorations I already had and spent all day yesterday decorating. Try to stop by my blog on Friday for all the pics. I love your decorations. I'm hoping my husband helps me pull mine out tonight. You are ready for fall. Love the front porch. You've got everything looking so nice around your house. I love your front display. I started the fall decor about three weeks ago when the weather first turned cooler. Then it warmed up- can I say 90's again?! I am happy to say it's going to stay cool now. Football weather, I call it! I love all of your fall decor, especially how warm and welcoming your front porch looks. I see that you are not too far from me...I'm in the Charlotte, NC area. I'll be passing through your town on the way to the beach next week!